It is coming to the end of another successful winter program for the Donard Group. In October the group welcomed Raymond Hillman to the group, hearing about his career in agronomy in Northern Ireland. It was great to see pictures of group members showing the part they have played in developments over the years (and with a few less grey hairs). During November members heard from Phelim O’Neill about the impact Brexit may have on the agrifood industry from the perspective of both Northern Ireland and the Republic of Ireland. 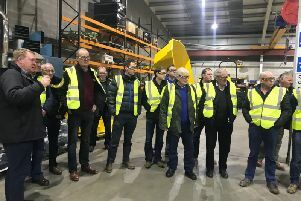 The group also held a group trip, joint with the South West Down group, to the JCB factory in Staffordshire along with some farm visits. This was enjoyed by all. For January the group held an on-farm breakfast meeting to hear from John McCallister on land mobility and from the health and safety executive on farm safety. Thanks to David and Kenny Martin for hosting the meeting. The group AGM presented an opportunity to hear from Ivor Ferguson from the UFU for updates on ongoing issues and policy update. The final meeting of the winter programme is on 13th March when we are hosting Dr Sam Strain to hear about Johnes disease. All members are welcome to attend. For the centenary year of the UFU, the group members are raising £2,000 for Air Ambulance. To raise money for this worthy cause they will be hosting a group BBQ, as well as the Group Managers climbing Slieve Donard. Any group members who would like to take part in the climb please let us know. More details will follow in due course. Group leaders would like to thank our speakers for a successful winter programme, the members for their continued loyalty and wish everyone good luck for a prosperous and successful spring and summer of 2018.